Dubai, United Arab Emirates, 10th Nov 2018: DP World, UAE Region has been recognised for its significant contribution to the UAE's trade and outstanding performance by winning the Port and Terminal Operator Award at the prestigious Seatrade Maritime Middle East Awards. 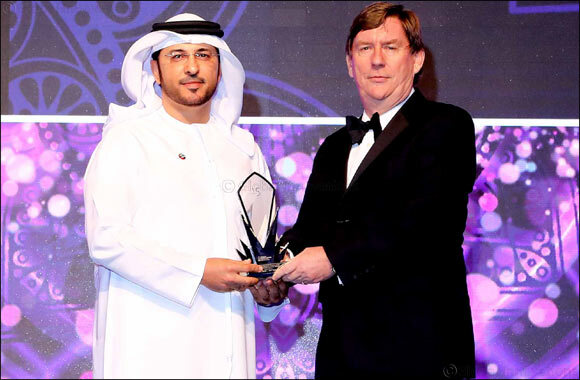 The Award was received by Abdulla Bin Damithan, Chief Commercial Officer, DP World, UAE Region at a gala ceremony in the presence of more than 700 leading maritime industry professionals. Mohammed Al Muallem, Chief Executive Officer and Managing Director, DP World, UAE Region, said: “This is another headline day for DP World and all our Dubai-based employees. I congratulate the UAE Region team on their achievements highlighting our role in the global supply chain and development of a smart port complete with modern automated systems and value-added services. The Port and Terminal Operator of the Year is a strong endorsement of our contribution to maritime trade in the country and across the region. In 2017, DP World, UAE Region won the Outstanding Achievement Award at Seatrade Maritime Middle East. The company’s flagship Jebel Ali Port is one of the most technologically advanced ports in the world and has been rated as the most productive globally. It has a handling capacity of 19.3 million twenty-equivalent container units (TEU) a year and has become the preferred destination for cargo entering the MENA region, serving as a major transhipment hub on one of the busiest trade lanes in the world. The semi-automated Terminal 3 is the largest container terminal of its kind in the GCC and one of few that can berth new age Ultra Large Container Vessels (ULCVs) with capacities over 20,000 containers. In the first nine months of the year DP World, UAE Region handled 11.3 million TEU (twenty-foot equivalent units), while globally DP World recorded 53.6 million TEU, a 2.6 per cent increase year-on-year. The Seatrade Awards programme is widely recognised as the region’s premier maritime event.